Ulla Billquist was a singer and one of the most known names in music of the twentieth century. She remains forever linked with the Second World War years through the song “Min soldat”. During this time she and Jussi Björling became almost national icons. When Ulla Billquist was just six months old her father died, leaving her mother, Gerda Schönström, a widow with four children. Despite the family’s difficult financial circumstances she was able to ensure that her sons had proper training for their later careers (one became a goldsmith, the other a dentist). Her two daughters, Ulla Billquist and her sister Margareta, both turned to the theatre. Ulla Billquist had dreamt of becoming an actress since she was a little girl. On her 16th birthday Ulla Billquist met the man she would later marry, Fritiof Billquist. At the time he was on tour in Örebro but he was working for Helsingborg stadsteater (town theatre). Ulla Billquist moved to be with him and enrolled at Helsingborg theatre school in 1925. That year she also made her debut as a singer for Radiotjänst (Swedish radio service), which had just begun transmitting regular programmes. At the same time Ulla Billquist began to get larger parts to play at Helsingborg stadsteater. When the theatre director Torsten Hammarén finished working at the theatre he wanted her to accompany him to Gothenburg and Stora teatern there. However, he was not keen on hiring Fritiof Billquist, and this resulted in the young couple moving to Stockholm instead. There they were both hired by Ulla Billquist’s brother-in-law Thor Modéen, who was a star of revue shows at Odéonteatern. Ulla Billquist subsequently became hired by Ernst Rolf and was given one of the three leads in the operetta Tre små flickor, performed at Djurgårdsteatern. Following this success Ulla Billquist decided to give up acting and to focus on singing instead. In 1929 Ulla Billquist had her public breakthrough with the show number “Köp rosor monsieur” in Cirkusrevyn. The following year she was the leading lady alongside the debutante Zarah Leander in the revue Det Glada Stockholm, performed at Folkan. She performed yet another revue role before taking a long break from the theatre in favour of singing on the stage, on records, and on the radio. In December 1929 Ulla Billquist travelled to Paris, in order to record her first three albums for the Pathé recording label. Her records garnered positive reviews in the papers but shortly afterwards the Swedish branch of Pathé went bankrupt. C.B. Sandqvist, the director at Columbia records who had known Ulla Billquist since her days in Helsingborg, signed her and she subsequently became one of the most popular artists on that label in the 1930s. Ulla Billquist returned to the revue stage at the end of the 1930s. She began to work with Nils Perne, who was tied to Sonora records. In the autumn of 1939 she appeared in a revue optimistically entitled Det kommer en vår (“a spring is coming”), for which she sang the title tune. In the same revue Naemi Briese sang the newly written song “Min soldat”, which reflected the emotions aroused by the outbreak of the Second World War in 1939. 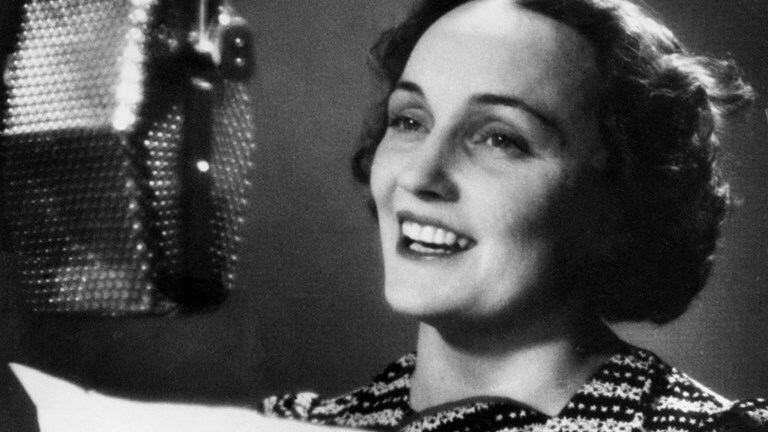 Nils Perne persuaded Ulla Billquist to change record companies and in May 1940 Ulla Billquist made her first recording for Sonora, which included “Min soldat”. She had become one of the most popular artists in Sweden and had signed the most advantageous record contract yet offered to a female artist. The crooner Sven Olov Sandberg was probably the only other artist in possession of a more lucrative contract at that time. His star appeal faded somewhat by the early 1940s, however, whilst Ulla Billquist’s fame was lifelong. Ulla Billquist became the leading star of the Second World War era in Sweden. She toured throughout the country, singing for soldiers wherever they were billeted. The man in charge of the wartime touring artists was Folke Bernadotte, who worked with Ulla Billquist and became one of her friends. Ulla Billquist had a daughter called Åsa with her first husband Fritiof Billquist. The marriage did not last, however, and the couple divorced in the early 1930s. In 1936 Ulla Billquist married the businessman Wolmar Sjögren, whose daughter Sonja from a previous marriage was of a similar age to Åsa. In 1941 Ulla Billquist got divorced for a second time, only to remarry in January 1943 to her musical accompanist Gunnar Hahn. This too was a short-lived union and by February 1946 Gunnar Hahn was no longer living in their shared accommodation. The couple was still going through the first legal stages of divorce when Ulla Billquist died in early July 1946. All of her husbands described their marriages as stormy. Ulla Billquist secretly frequented bi- and homosexual artistic circles. She was also part of a women’s network in which the women all took male names – Ulla was knows as “Olle”, Kai Gullmar was known as “Kungen” (the king), and Zarah Leander was called “Alex”. The reason for the secrecy was that homosexuality was illegal until 1944 and thus it is highly likely that Ulla Billquist was the subject of blackmail. She and her daughter Åsa both expressed that finances were tight although they lived simple everyday lives whilst benefiting from an advantageous record contract and many well-paid performances. Ulla Billquist’s artistry was different from that of her singing contemporaries’ in that she often chose songs and texts which expressed her own feelings. She sometimes gave into the record company’s requests to record popular one-hit wonders but nevertheless a clear artistic profile emerges from her repertoire. Her younger colleague Alice Babs, who sometimes collaborated with Ulla Billquist in the radio studios, has stated that the Portuguese fado singer Amalia Rodrigues in some ways reminds one of Ulla Billquist’s singing. Ulla Billquist regularly had singing lessons with Professor Ragnar Hulthén, who developed her voice and helped her to learn new songs. In October 1945 she organised, off her own back, a literary evening of ballads at the concert houses in Stockholm and Gothenburg, both of which were artistic successes. In early December 1945 the house she shared with Gunnar Hahn in Västerljung burned down to the ground. Ulla Billquist’s personal archive of records, pictures, newspaper clippings, and more, all went up in smoke. She lost all the mementos of her career in the fire, and this had a serious impact on her emotional state, leaving her quite low for the last six months of her life. According to her friend Brita Conradson Ulla Billquist spent this time reading philosophy and mulling over things. On 6 July 1946 Ulla Billquist committed suicide. Three years later her friend Hasse Ekman produced the film Flicka och hyacinter (1950) which was inspired by her life. Hasse Ekman’s anonymous tribute comprises a captivating description of a sensitive artistic soul and her death which comes as the result of a homosexual love affair. He was ahead of his time with his portrayal of homosexual love as pure and beautiful, while the male heterosexual singer in the film is depicted as a morally loose man who sees a different woman every day. Only three filmed segments of Ulla Billquist survive: Landskamp, 1932, the filmed advert Vademecum, 1939, and the short Gatans serenade, 1941. We have no recording of her spoken voice as the only surviving radio segments are all of Ulla Billquist singing. There are 370 musical recordings of her, which were made in the period of 1929-1946. In 1984 the Ulla Billquist stipend was established. It is awarded to a significant young artist within the spheres of theatre, singing and music. Ulla Billquist is buried on the Norra cemetery in Solna. Ulla Ebba Ingegerd Billquist, www.skbl.se/sv/artikel/UllaBillquist, Svenskt kvinnobiografiskt lexikon (article by Lasse Zackrisson), retrieved 2019-04-23.